1987-11-12. Good. Ships with Tracking Number! INTERNATIONAL WORLDWIDE Shipping available. May not contain Access Codes or Supplements. May be ex-library. Shipping & Handling by region. Buy with confidence, excellent customer service! London: Holland Press, 1983. Minor wear to DJ edges, tips lightly bumped, otherwise very clean, tight and bright.. Hard Cover. Near Fine/Near Fine. 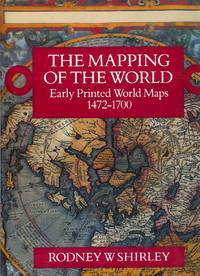 The Mapping of the World; Early Printed World Maps 1472 - 1700. London: Holland Press, 1984.. 2nd . Hardcover. Fine condition/fine. Bound in publisher's original maroon cloth with spine stamped in black and gilt. Pictorial endpapers. 669 pages. Publisher's original matching maroon slipcase. The Holland Press, 11/12/1987. 2nd Revised edition. Hardcover. New. xlvi, 669 p. : ill., maps (some col.) ; 35 cm. Hardcover and dust jacket. Clean, unmarked pages. Fine binding and cover. Illustrated lining papers. This is an oversized or heavy book, that requires additional postage for international delivery outside the US. Littlehampton Book Services Ltd, 1984. A FINE FIRST EDITION IN DJ AND SLIPCASE. FIRST. Littlehampton Book Services Ltd, 3/15/1984. 2nd. Hardcover. Like New. xlvi, 669 p. : ill., maps (some col.) ; 35 cm. Hardcover and dust jacket. Fine binding and cover. Slight sunning to spine. Clean, unmarked pages. Original promotional papers included. Illustrated lining papers. Holland press cartographica, vol. 9. This is an oversized or heavy book that requires additional postage for international delivery outside of Canada and the US. 1984-06-01. Good. Ships with Tracking Number! INTERNATIONAL WORLDWIDE Shipping available. May not contain Access Codes or Supplements. May be ex-library. Shipping & Handling by region. Buy with confidence, excellent customer service! Littlehampton Book Services Ltd, 1984-03-15. Hardcover. Good. Holland Press, 1983. First Edition. Hardcover. Very Good/Very Good. Red hardback complete with original dustjacket, showing well, no splits, no dents, sharp corners, no tears, strong joints. Contents crisp, tight and clean, no pen-marks. Not from a library so no such stamps or labels. Size: 350mm x 250mm; collation: pp. xlvi, , 669. A well illustrated highly detailed work. Thus a better than very good copy. THE MAPPING OF THE WORLD: Early Printed World Maps, 1472-1700. London: New Holland Publishers, (1993). Revised edition. Hardcover. Fine in fine jacket. Folio, original maroon buckram, xlvi, , 669 pp., profusely illustrated. Essential cartobibliography of antique world maps with 639 entries organized chronologically. Shipping weight is approximately 10 pounds and extra charges will apply. The Holland Press, 1983. Hardcover. Very Good. No markings. Oversize. Small tear to front cover of the dust jacket and tears to the edges of the dust jacket. 669 pages. Light spotting to page edges. Lacks slipcase. Volume 9 in the Holland Press Cartographica series. London: The Holland Press, 1983 Thick folio (13 1/4 x 9 1/4 in. ; 33.7 x 23.5 cm). Volume 9 of the Holland Press Cartographica. Pictorial endpapers, half-title, and title-page, over 440 illustrations (18 in color), xlvi, 669 pages including 7 charts of mapmakers, chronological listing and rarity index, list of lost or apocryphal world maps, list of lesser known mapmakers, chronology of discovery, list of plates, and general index. CONDITION/BINDING: As new: very clean, tight, and bright. Publisher's maroon cloth, faux spine label printed in black and gilt, pictorial dust-jacket; lacks slipcase. THE ESSENTIAL REFERENCE WORK ON ANTIQUE WORLD MAPS. The author, Rodney W. Shirley (1928-2017), was a leading British scholar and authority on maps as well as the first president of the International Map Collectors' Society (1980). .